Salad is usually not the star of the Thanksgiving meal. Most people look forward to the turkey, stuffing, cranberry sauce, rolls, and dessert. We always serve a green salad anyways because eating a little salad makes us feel better about the rest of the meal, right? :) Well, this year make sure you save room for the greens because this Maple Roasted Butternut Squash & Apple Salad just might steal the show. It is that good! To make the salad, I roasted maple glazed butternut squash and apple chunks in the oven to bring out their flavors. I added the squash and apples to a bed of mixed greens. I also topped the salad with dried cranberries, pepitas, and feta cheese. I like to serve the salad with a maple mustard dressing. The recipe is included below. It is easy to make, but if you are in a pinch a store bought balsamic or cranberry dressing work well too. 1. 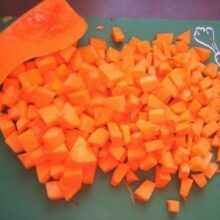 Preheat the oven to 400 degrees F. Place the butternut squash and apple chunks on a large baking sheet. Add olive oil, maple syrup, salt and pepper and toss. Roast the squash and apples for 25-30 minutes, turning once, until tender. Remove from the oven and cool to room temperature. 2. While the squash and apples are roasting, make the maple mustard dressing, if using. Combine garlic, mustards, syrup, vinegar, salt and pepper in a blender or food processor. Blend until smooth. With the machine running, pour in oil in a slow steady stream to emulsify. You should have about 2 cups of dressing. You will not need it all for the salad. You can store the leftover dressing in the refrigerator for about two weeks. 3. 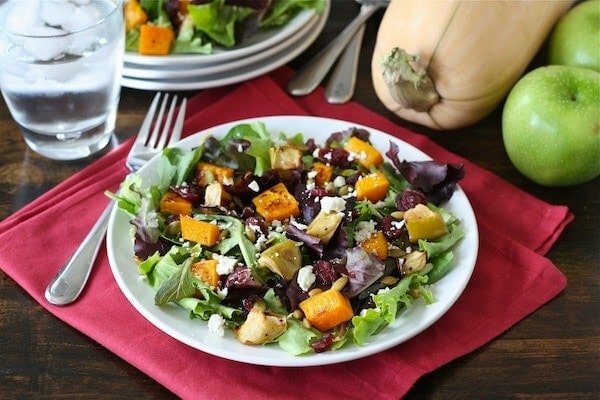 Place the mixed greens in a large salad bowl and add the butternut squash, apples, dried cranberries, pepitas, and feta cheese. Drizzle dressing over the salad to moisten and toss well. Serve immediately. Note-you can also serve this salad with a store bought balsamic or cranberry dressing. This looks delish! I was at TJ’s today and the sample girl was sampling a squash salad with maple and she had wild rice in her version. Yours looks amazing and now I really have a craving for a roasted butternut squash salad! A marvelous autumn salad! So colorful and fresh. That is vibrant and gorgeous!! 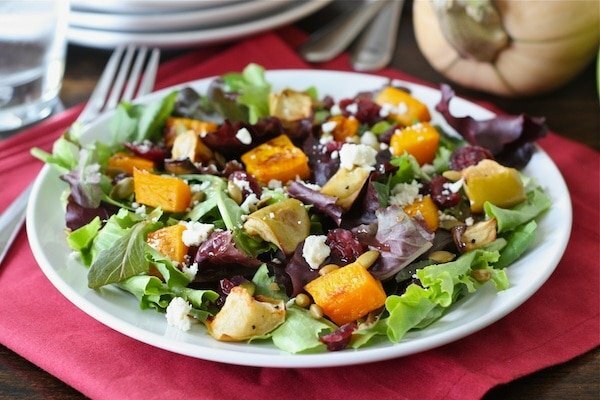 Roasted pumpkin salads are the best! Love that squash! I could just eat that. Great salad! This salad looks like it could be the star of any meal. Just beautiful. And, it sounds so delicious, too! i can honestly say that i’ve never had a salad on thanksgiving, but i would totally make an exception for this bad boy. yum! This looks absolutely delicious and I LOVE the colors! I’m thinking we’re going to have to have this for dinner tonight with some grilled chicken. Hope Josh isn’t feeling too sore this morning after his accident yesterday! what a gorgeous salad!! that makes me that you serve it just to feel a little better about eating all that yummy T-day food! I actually do that everyday! ha whenever we order pizza i always make ava a little salad…she usually only takes two bites of the greens! lol worth a try! See?! I came running! I’m not waiting until Thanksgiving for this! I called hubs just now to tell him to bring me a butternut squash when he comes in today and he says like the yellow ones? Guess I better go get the squash, lol! I love the addition of pepitas! We always serve a light salad too, but THIS, is so my kind of salad! What a gorgeous fall salad for Thanksgiving – love all the harvest colors. I think if I had this on our table, I would eat more of this and less of the heavier foods – it would definitely make me think twice about what I put on my plate. This was MEANT for my face and stomach. I just tried squash for the first time this year and absolutely love it! This looks amazing! That Vinaigrette is sounding awfully tasty! that is one gorgeous salad… the colors are so pretty! i think it’s a great idea to serve salad at thanksgiving. it seems like no one does! this salad looks so good… want some now! I was just asked to bring a salad to my families Turkey Day dinner. Question can I roast the squash and apple ahead of time and then bring the salad to dinner and assemble later? or will the apples turn brown and not be so good? The apples kind of wrinkle and brown when you roast them so I think you will be fine to roast the squash and apples ahead of time. Enjoy! what a gorgeous salad, maria! This looks really good! I am always looking for new combinations of things to try and although I have heard a lot about it, I have never had apples in something like a salad. It’s just seems kind of odd to me, like the combination of strawberries and balsamic. But once I forayed into that world, I was in love, so this is definitely something that I need to try soon! Gorgeous salad, and I especially love the maple-mustard dressing! Yum! I seriously think there are not enough colorful foods (veggies) at Thanksgiving dinners. One time I looked at a spread at a friend’s house we were having Thanksgiving with and everything there was a shade of brown! Salad looks great! Having salad absolutely makes me feel like I’m allowed to overindulge a little more on sides and dessert – I ate healthy, now bring it on! We love butternut squash, such great flavor and texture. 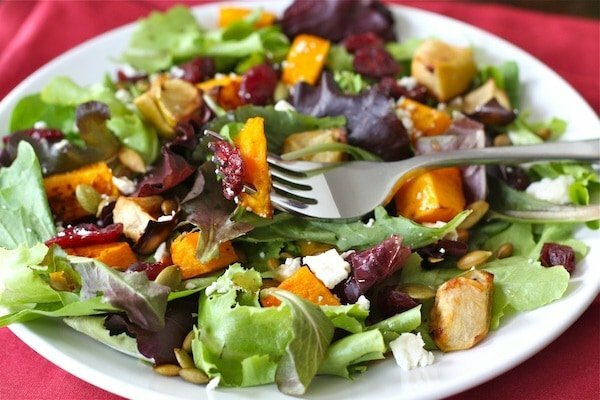 I love the idea of adding roasted squash to a green salad. Delicious! That is quite a list. And I LOVE The idea of having salad with Thanksgiving dinner. Perfect addition in my opinion! For the past few years I have brought some type of veggie or salad to my MIL’s Thanksgiving dinner. This year I am bringing my Holiday Fruit Salad & Wild Rice Salad. This may have to be in the plans as well, as I really wanted to bring a trio of salads. What a beautiful and flavorful salad – it so festive & colorful. This salad is at LEAST going to find it’s way into my lunches next week, if not my T-Day table! Perfect! I’m always in charge of the salad at Thanksgiving. Love this salad so much… I’m thinking it’s lunch tomorrow! This sounds wonderful, Maria and would make such a colorful contribution to the Thanksgiving table. I have been CRAVING butternut squash recently so I ordered a very similar salad the other night at a restaurant. I just love tossing squash with fresh greens. This looks fabulous! This sounds great! I love that you roasted the apples with the squash. Yeah for salad at Thanksgiving!! I am with you – it definitely needs to be on the table and this one would be perfect – flavors, colors, everything!!! I love a steal the show salad 🙂 Pairing squash with apple sounds fantastic! Ooh I love this salad. You won’t believe how many squashes and apples I got here. Perfect for lunch tomorrow as I get my house ready for Thanksgiving! We don’t normally have a green salad for Thanksgiving, but I think we need to change that this year!! This was sooooo delish! By the looks of it I knew it would be good but I wanted to test it out before adding it to our Thanksgiving menu. I made it with tonight’s dinnr and it was even better than expected and I can’t wait to share it with all the family. I found your blog a while back but only recently started following it. I really like the format. It is very neat and clean and the pictures are great. I have printed many recipes that I know will be a hit with my family. Thanks. Part of my job this year is to bring the salad and this is fit for queens and kings. I actually was thinking this could be an easy friday night supper for us. We tend to eat light on days we are not entertaining or dining out. That salad looks sooooo delicious and healthy. I am invited to Thanksgiving dinner but I will save the recipe and make it for Christmas or why not anytime? I love a good salad as much as about anything, except dessert of course. This looks so good and sounds like it has some great fall flavors. Thanks for sharing! Not every dish at Thanksgiving needs to be indulgent! This is colorful, beautiful and healthy! I always make sure to serve salad at Thanksgiving too. It balances out all that gravy and stuffing! Perfect for the season. I make soup with squash and apple and it is delicious. This salad, I am sure, will also be tantalizing to the tongue. This is so cool! My girls love butternut squash — sounds like the perfect salad for tomorrow’s lunch. Glad we were at Food Network’s Communal Table together! Just made this salad for dinner and it was delicious! One adjustment I made was to carmelize the pepitas in a little butter and brown sugar. It added a nice texture to the salad. Great recipe! Brown grainy mustard? Is that spicy brown mustard? I don’t want to get the wrong kind and mess up the taste. Thanks! Yes, spicy brown mustard. Enjoy! A very appetizing recipe and a wonderful presentation. 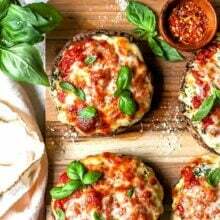 Congratulations for the recipe and your blog, nice to meet you. Bye see you soon. I made this for Thanksgiving and again for a holiday party last night. A total success and a real keeper of a recipe! This salad is SOOOO much better with smaller raw apple chunks. unlike everyone who commented that this salad looks amazing… i actualy made it and it was fabulous!! my guests were highly impressed and finished the whole thing! Fantastic recipe and photos. 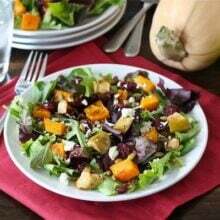 I have posted a link to your recipe on my own recipe for roasted butternut squash salad with tahini-yogurt-herb dressing, do take a look when you have a chance. I have also recently published a cookbook on healthy Indian food. This looks so good! I’m bringing it to our work Thanksgiving potluck! This Salad was a HIT last month at a neighborhood dinner. And the next day (I did not dress the salad) it was even better! I am serving it at a dinner party tomorrow night. And I’ll roast the squash/apples today. EASY and DELISH! And if you’re looking for another butternut squash recipe – this soup was a hit! I made this for Thanksgiving dinner. It was fabulous! Got lots of compliments and recipe requests. Some one referred to it as ‘world class’. I think I’ll be making this every Thanksgiving and some other times. Thanks for a great recipe! Thanks! 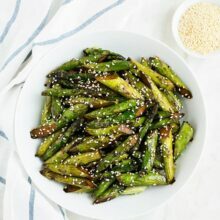 This recipe was great my husband even ask me to prepare more salad so when he is hungry he can eat it as a snack!!! Delicious!!!!!!!! 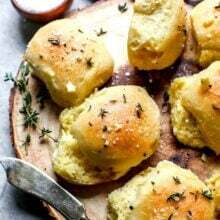 Pingback: 20 Amazing Thanksgiving Recipes!! This salad is my #1 Thanksgiving staple! It steals the show every year. Thank you, thank you, thank you for this and your many other amazing recipes!